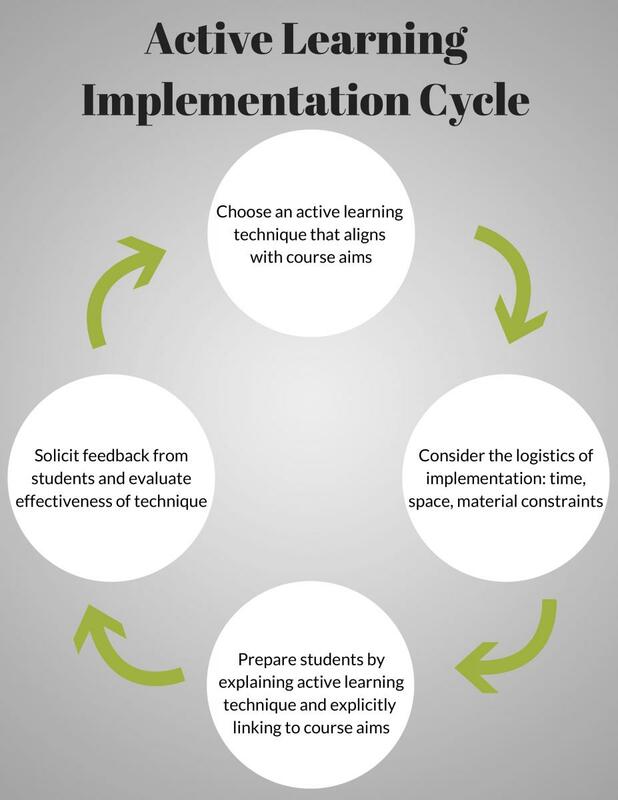 There are a few things to keep in mind when implementing a more active learning framework into your classroom. First, take an inventory of what strategies and techniques you are already using, and which you feel drawn towards. It can be much more effective to build on practices already incorporated in your course materials rather than radically shifting the framework of assignments and interactions. Also, consider incorporating active learning into areas of the class that are directly assessed or that support major, evaluative pieces of the grading scheme. Students who may be apprehensive about engaging in a new or unfamiliar technique may be more willing to do so if the connection to exams,or final projects is clear. Start small because some students may not be ready or well-prepared for many active learning techniques at once. For example, choose one simple technique from the active learning strategies to try in a class. Explain the benefits for using active learning techniques and connect the activity to student learning outcomes for the class. Think about how you will facilitate the process for each step of the way. For example, how will you introduce the active learning activity? How much time will you give students? How will you debrief? Consider the logistics of getting students (a small or large group of students) back on track after an active learning activity. Regularly check in with students, through both informal and formal feedback, about how the active learning techniques are impacting their experience of the class. This short video explains in more detail how you may use other simple active learning strategies in your teaching (e.g. Think-Pair-Share, Jigsaw, Simulation, or Role-Play). Will I have to completely change my course in order to incorporate these new techniques? Active learning can be incorporated purposefully into single assignments or into small changes to a course over time. Professor Fei Wen added a video assignment to her upper-level chemical engineering class and saw great improvements in concept retention without dramatically changing lectures, homework, or exams. By incrementally adding in active learning, Professor Lisa Young improved the writing skills that her students were building in her course by incorporating small changes to writing assignments and lectures with each iteration of the course. Is my class too big to use active learning strategies? Some techniques might be hard to use in a lecture class of 100 (or 400! ), but there are ways to make them work. Try simple techniques like Pair-and-Share or use of technology, like Professor David Gerdes did by polling students and gauging their understanding in real-time. Will explaining technology, tools, or techniques take up too much instruction time? Hubs of resources like CRLT, the Language Resource Center (LRC), or Scholar Space can help support the technical and pedagogical aspects of active learning. Professor Nicholas Henriksen engaged the LRC to help make screencast videos to teach technical software functions so that he could free up time to discuss the projects students make with the software. Will I be able to cover enough material if I’m spending class time on active learning activities? There is no question that even the simplest active learning techniques take time “away” from more traditional content delivery, like lecturing. Some faculty, like Professor Remington, “flip” their classroom, having students work through self-study modules before class to cover content, and using the actual class period to assess and supplement their learning in an active way. By having her students bring in the content, Professor Gabaron retains the structure and pedagogical integrity of her upper-level French class while capitalizing on their varied interests. What if students resist active learning? Specifically, what if I ask them to talk to a neighbor, and they simply refuse? What if they do not see active learning as teaching? What if my teaching evaluation scores plummet? 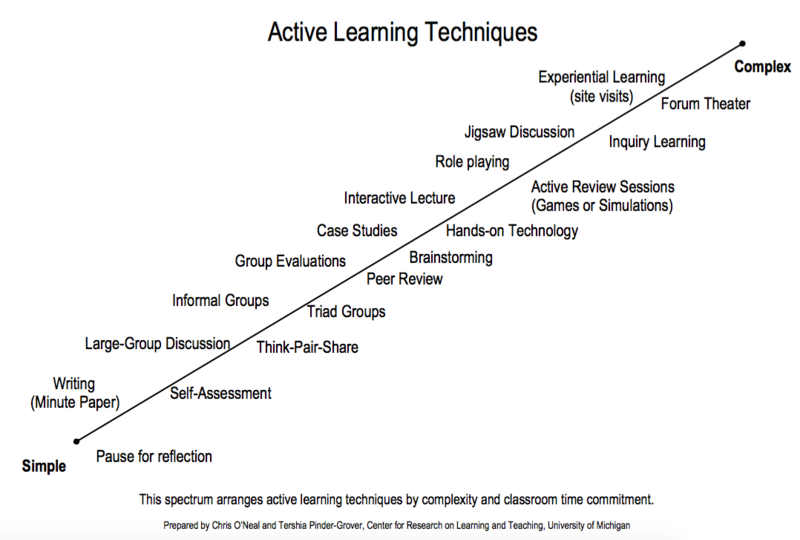 These concerns are real and significant roadblocks to implementing active learning in classrooms, but as more instructors have started using active learning in teaching, students have become more receptive to this approach. A recent study conducted at U-M found that students showed “little resistance to active learning” in 18 U-M engineering courses with 1051 students (Finelli, et al, 2018). They also found that two sets of strategies improved student receptiveness to active learning: 1) explanation strategies involve describing the purpose of activities and why they are valuable for student learning, 2) facilitation strategies include instructor behaviors that foster student interaction and encourage students to engage in the learning activities. For details on how to reduce student resistance to active learning, read the entire study. Explore our faculty case studies to learn more about the challenges to implementing active learning, and the solutions to those challenges! Our resources page includes much of the research that supports our enthusiasm for active learning, as well as some discipline-specific resources for further reading. As always, CRLT has a variety of resources, from our blog to one-on-one consultations, to support you.